Wait – I missed it. My own anniversary. This blog started on October 11, 2006, a little over two years ago. It has been a lot of fun and I hope you have enjoyed my musings. This past Tuesday, I had a book signing in Chapel Hill. I had a great time and enjoyed the company. Back a few months ago when this opportunity came open, I asked my wife if she and the kids would be interested in going with me, spending the night, and going on to Raleigh on Wednesday. A special exhibit is going on at the Natural History Museum: the Dead Sea Scrolls. We really enjoy seeing this type of programming, and have seen the Treasures of Ur exhibit at the McClung Museum in Knoxville and the King Tut exhibit in Fort Lauderdale. She said yes, and we set up to be gone, which included creating a podcast for my wife’s classes. We were driving along on Tuesday, when what did we hear, but the “Anointed One” had announced that he would be in Raleigh on Wednesday. After we got to our room, we checked his schedule, and sure enough, it said ten am, and just a block from the science/history museum. Talk about a bummer! So, we had a slow morning, went out to eat, got in downtown Raleigh, and no parking. Worshippers were lined up for at least two blocks. We decided to head north to Oakwood Cemetery. From the cemetery, we could hear bits of the speech, and the throngs cheering. Regardless of how I feel about a candidate as an individual, I find the exhibited demagoguery appalling; our founding fathers would be horrified to see presidential candidates treated like Roman generals being made emperors by acclaim! We later learned that there were 25,000 people to hear Obama. They apparently all parked across the street from the museum. We did not get into the museum until 2:00 pm. While it would be nice if any politicians actually gave us some of the stuff they promise, we just want our morning back. I did manage to sneak into the History Museum for a couple of minutes. They have the 18th NCT’s Branch flag on display, along with two flags of the 26th NCT. I did pick up a copy of the new book, Worthy of Record: The Civil War and Reconstruction Diaries of Columbus Lafayette Turner, edited by Kendrick N. Simpson. Turner served in the 33rd NCT. 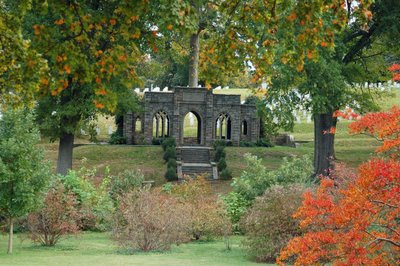 I thought I would enclose a few images that I made at Oakwood Cemetery. The Oakwood Preservation Project members, including Jeff Morton, Charles Purser, and Tom Smith, are to be congratulated for their wonderful work on restoring the Confederate Cemetery at Oakwood. For our study today, I thought we would move about as far away from my mountain home (where it is currently snowing), as we can get: Brunswick County. I have been fortunate enough to visit Brunswick County four or five times in the past ten years. Each of those stays was for several days, including a week at Fort Caswell. Brunswick County is located in the coastal area of North Carolina. The county was formed in 1764 and named for King George I, who was also the duke of Brunswick. The area had been settled by Europeans several decades earlier. Brunswick Town, founded in 1725, was the first permanent European settlement on the Lower Cape Fear River. Bolivia was once the county seat, but since 1975, Southport has gained that honor. In 1860, the total population of the county was 8406, including 3,021 slaves. That same year, the presidential vote was also a tie. Breckinridge received 326 votes, while Bell received 386. Douglas got one. The elected convention representative was Thomas D. Meares. Brunswick County men served in the following regiments: Company G, 20th North Carolina Troops; Company C, 30th North Carolina Troops; portions of Companies G and K, 36th North Carolina Troops (2nd North Carolina Artillery); and, Company G, 51st North Carolina Troops. 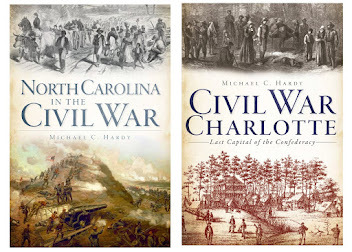 You might say that the Civil War in North Carolina began in Brunswick County. On January 9, 1861, a group of local militia seized Fort Caswell. Named for North Carolina’s first governor, Fort Caswell was a part of the third system fortifications along the coast of the United States. The fort was manned only by a caretaker. That same day, Fort Johnston, a little to the north of Fort Caswell, was also seized. Fort Johnston was much older, portions of it dating back to 1745. Both forts were returned to the Federal government by Governor Ellis, only to be retaken on April 16, 1861. Fort Johnston was served as a early recruiting and training depot, and functioned as a supply depot for much of the war. The fort was modified, beginning in late 1861, with an earthen battery, which in 1863, was expanded. The battery contained four, 10-inch guns. 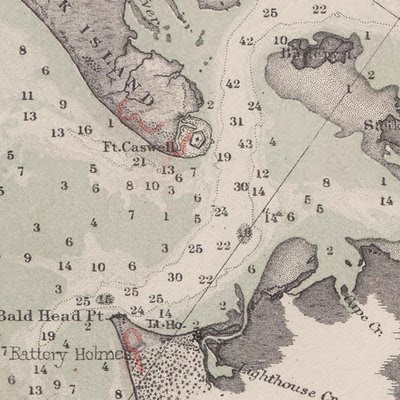 The fort was also known as Fort Branch, and in late 1863, Fort Pender. The 20th North Carolina Troops was stationed at the Fort until June 1862. Portions of the 1st North Carolina Artillery were also stationed at the fort, along with portions of the 2nd North Carolina Artillery. Fort Johnston was abandoned after the fall of Fort Fisher. Later, the fort was garrisoned by the 149th New York, 27th and 37th United States Colored Troops. The Confederate earthworks were gone by 1870. Today, only the officers’ quarters are left. Fort Caswell was likewise reworked, and massive sand batteries were constructed around the fort’s brick walls. These earthworks protected 29 heavy guns. These included 32-pounders, 8 and 10-inch Columbiads, and a 150-pounder Armstrong. Two of the guns on duty at Fort Caswell survive: they flank the Confederate monument on the capitol grounds in Raleigh. There were several plans laid in 1862 through 1864 to bombard or assault Caswell, but none of these plans was ever executed. Finally, with the fall of Fort Fisher across the Cape Fear River, Fort Caswell was abandoned. On January 16, 1865, the barracks were burned and the magazines destroyed. When the magazines blew up, they took a large portion of the fort with them. The explosion was felt as far away as Wilmington and Fayetteville. Both the garrisons from Forts Johnston and Caswell retreated north to Fort Anderson. This earthen fort, which is incredibly preserved, was constructed at the site of the ruins of Brunswick Town mentioned above. The fort was first known as Fort St. Phillip, named in honor of the church ruins on site; later it was called Fort Henderson, and finally, Fort Anderson, in honor of the late Confederate general George Anderson. The massive earthen walls contained ten cannons. In February 1865, the fort withstood three days of bombardment before the garrison evacuated during the night. Other earthen batteries were constructed in Brunswick County during the war. They included Batteries at Dutchman Creek, Deep Water Point, and Reaves Point. Also on Oak Island near Fort Caswell was Battery Campbell, containing at least fifteen guns, including a 100-pound Brooke Rifle. Between Campbell and Caswell was a battery with one 10-inch Columbiad. This might have been called Battery Shaw. Across from Fort Caswell and Oak Island is Bald Head Island and the Bald Head Lighthouse. The southern tip of the Island contained at least five batteries, the most impressive of which was called Fort (or battery) Holmes. The current Bald Head Lighthouse was constructed in 1817. During the war, the lighthouse guided blockade runners into the Cape Fear River. The light was darkened with the Fall of Fort Fisher. While no longer in use, the Bald Head Lighthouse is the oldest such structure in North Carolina. The Confederates from Forts Caswell and Anderson retreated north and made a stand behind Town Creek. The Confederates, under the command of Brig. Gen. Johnson Hagood, were flanked out of their position, losing some 400 men captured. Brunswick County offers a visitor some good places to visit today. Fort Anderson/Old Brunswick Town is a state park and well worth a visit. The earthen fort at Old Brunswick is impressive. Fort Caswell still survives, and is owned by the North Carolina Baptist Assembly. Make sure you stop by the office to announce your presence to the folks there. You can also ferry over to Bald Island to see the lighthouse. 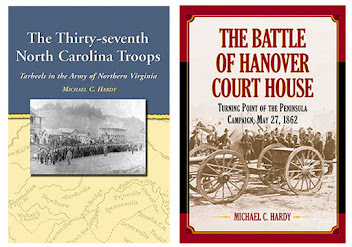 Sources: Johnson, Touring the Carolinas’ Civil War Sites; Angley, A History of Fort Johnston; Herring and Williams Fort Caswell in War and Peace; Powell, Encyclopedia of North Carolina. Well, I missed posting a county last week, so I am behind. Maybe I can get two done this week. I thought we would look at Yadkin County first. Yadkin County is located in the foothills of western North Carolina, not far from Winston-Salem. The county was formed in 1850, taken from Surry county, and named for the Yadkin River that flows through the county. Yadkinville, the county seat, was chartered in 1857. According to the 1860 US Census, Yadkin County had a total population of 10,711, including a slave population of 1,438. In the 1860 presidential contest, Yadkin County voted overwhelming for Bell (842, 495 for Breckinridge, and 23 for Douglas). In the February 1861 call for a convention, Yadkin voted 34 for calling the convention, 1490 against. Their delegate was R. F. Armfield. Yadkin County men largely served in these organizations: Company B, 21st NCT; Companies F and I, 28th NCT; Company B, 38th NCT; and, Companies A and H, 54th NCT. The number of local Confederates has been placed at 1,200 men. One of the most memorable activites in the county during the war occurred at the Bond School House. At the start of the war, local resident Jesse Virgil Dobbins did not want to join the Confederate army. He continued to resist after the conscription act in 1862. Some cite his Quaker beliefs as the obstacle. However, his beliefs did not stop him from wanting to join the Union Army. Dobbins, believed by some to be the head of Unionist activities in Yadkin County, began to fear the Confederate authorities, and determined to slip across the mountains to east Tennessee. He, along with several others, met at the Bond School house, near Yadkinville, on the evening of February 11, 1863. Having learned of the gathering, the local militia converged on the school house, and on the morning of February 12, a shootout occurred. Two men on each side were killed. Dobbins and his brother, William, survived and joined the Federal army. I am not sure which regiment that Dobbins joined. There are men by that name in the 1st Battalion, Tennessee Light Artillery, 2nd Indiana Cavalry and 8th Indiana Infantry. There are over 38 men named William Dobbins in the Federal army, including a William T. Dobbins who served in the 1st Battalion Tennessee Light Artillery. Jesse survived the war; William did not. The other notable event was the arrival of Stoneman’s Raiders in April 1865. They passed through the county several times, and, on April 11, at a place called “Shallow Ford," on the Yadkin River, a portion of the command surprised part of the local home guard battalion. The local defenders put up some resistance, but were later driven off. 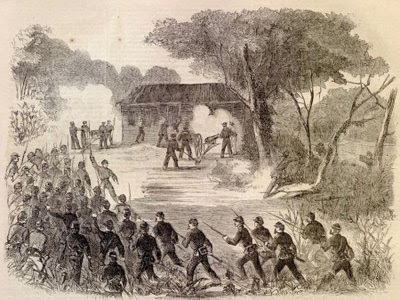 The Federals later burned the “Red Store” in Huntsville, and the mill at Buck Shoals. I have never found any reference to a United Confederate Veterans camp in Yadkin County, nor is there a Confederate monument. This Saturday, there will be a dedication for a North Carolina Civil War Trail Marker in Huntersville. Stop by if you get a chance. Well folks, I spent the past week trying to get two different manuscripts proofed. 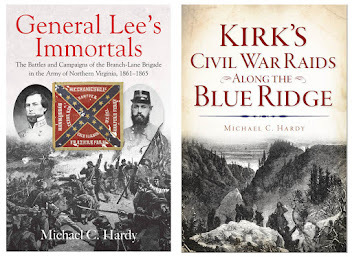 Neither of these books are Civil War related. The first is a short history of families of the sheriffs/jailers who lived in the Avery County jail. I’ve co-wrote this book with a fellow board member of the Avery County Historical Society: Mrs. Jimmie Daniels. Jimmie is one of those special people who lived in the jail while her dad was a deputy/jailer. This is a short book, about 55 pages, and it is my first attempt at self-publishing. I’ve written eight other books, but yes, this is my first attempt at publishing something myself. This book should be available in a couple of weeks. The second book is my fourth with Arcadia Publishing in South Carolina. It is a photographic history of Mitchell County. This book is set to be released in February 2009. So it is time to get back to the history of the 58th NCT. Tonight, I’ll be signing books in Brevard, NC, and on Thursday, I’ll be in Asheville. I have some great topics to blog about in the coming days, I just need to get these two projects off my desk. I recently finished the battle of Kolb’s Farm, a part of the Kennesaw Mountain arena of actions. This was probably the 58th NCT’s third highest casualty rate during the war. Right now, I am on July 4, 1864, and a little affair called the battle of Ruff’s Mill. To be honest, I’ve never heard of Ruff’s Mill. I’ve traveled in the area extensively, I’ve been to numerous reenactments in the area (is this not the weekend when they used to have the event down by the river in Rome? ), and I’ve read quite a bit, but Ruff’s Mill has slipped by unnoticed. Conley, in his history of the Army of Tennessee, makes no mention of the battle. Castel in his history of the Atlanta Campaign only makes brief mention of the event. I’ve checked several other sources, but I’ve not come up with much. Here is a little break down: Joe Johnston is retreating (big surprise). Sherman is advancing, but is unaware of the position of the Confederates to his front (big surprise). Joe Johnston has drawn his army up into a position known today as the Smyrna Line. Portions of the Federal army attack at Smyrna Camp Ground on the Confederate right, and at Ruff’s Mill on the Confederate left. Stevenson’s division of Hood’s corps is on the Confederate left, and bear the brunt of that attack, delivered by portions of Dodge’s corps. Now for my sticking point: some have written that Stevenson was positioned with two sets of breastworks, and the first was taken. However, not everyone, even the Federals, agree on that point. Private Dugger, my only 58th NCT source for this battle, simply writes that the Confederate skirmishers were driven in. So, I’m kind of stuck. Maybe Dugger is right, and the Confederates skirmishers were posted in a advance position in some type of works… I’m still digging into this. Stevenson does position his division at the Chattahoochee line. By the way, anyone know of the brigade placement of Stevenson’s division along the Smyrna line? Folks, I had a chance to attend the award banquet for the North Carolina Society of Historians this past Saturday in Hickory. 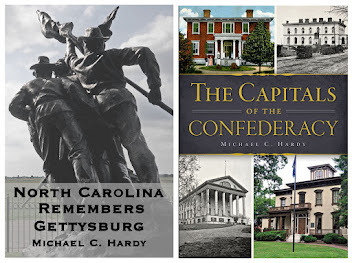 Two of my books, Remembering Avery County and Remembering North Carolina’s Confederate, were awarded the Willie Parker Piece History Book Award. This marks the third and fourth times I have won this award. Considering that there were 834 entries and only 107 winners, well, I am deeply honored. I had a great time catching up with some old friends and making some new ones. 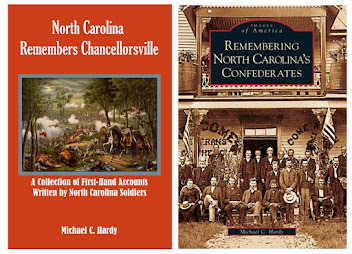 And, once again, thanks to the NC Society of Historians for honoring my work. I’ve been undecided about which county to do next in our little study. I was in Rowan and Cabarrus County on Tuesday, and there is a small write-up about Mitchell County in today’s Asheville Citizen. I finally decided to move a little further east and look at Pitt County. Pitt County is located in the Coastal Plane area of eastern North Carolina. The County was formed in 1760 from portions of Beaufort County and named for the earl of Chatham, William Pitt. Prior to European settlement, the area was inhabited by the Tuscarora Indians. The county seat, chartered in 1771, was originally known as Martinsborough, in honor of North Carolina’s last royal governor, Josiah Martin. In 1786, the name was changed to Greensville in honor of Patriot general Nathanial Greene. In 1860, the County had a total population of 16, 080 including 3,743 slaves. In the 1860 presidential election, Pitt County was practically tied. The residents cast 731 votes for Breckenridge, 710 for Bell, and eight for Douglass. While their presidential ideas were split, their belief in secession was not. When the vote came in February 1861, they voted 986 for, with 177 against the convention. Their representatives for the convention were Fenner B. Satterwhite and Bryan Grimes. Grimes resigned and was replaced by Pryton Atkinson. Numerous Confederate companies came from Pitt County. These included Companies E, G, I, and K, 1st Battalion Local Defense; Company G, 8th NCST; Company C, 17th NCST (1st Organization); Company K, 17th NCST (2nd Organization); Companies E and H, 27th NCT; Companies C, D, and I, 44th NCT; Company E, 55th NCT, and Company F, 61st NCT. One of the first Confederate battlefield fatalities, Henry Wyatt (battle of Big Bethel, June 1861), had spent a number of years in Greenville. It was estimated by a local historian that 1,376 Pitt County men served in the Confederate army. Military action came early in Pitt County. On June 5, 1862, “Col. Robert Potter [US], garrison commander at Washington, North Carolina, ordered a reconnaissance in the direction of Pactolus. The 24th Massachusetts under Lt. Col. F.A. Osborne, advanced to the bridge over Tranter’s Creek, where it encountered the 44th North Carolina, under Col. George Singletary. Unable to force a crossing, Osborne brought his artillery to bear on the mill buildings in which the Confederates were barricaded. 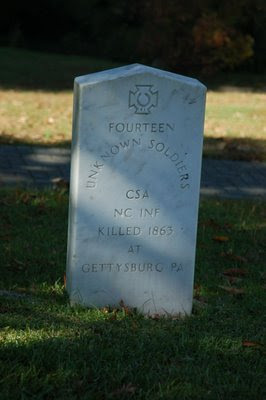 Colonel Singletary was killed in the bombardment, and his troops retreated. The Federals did not pursue and returned to their fortifications at Washington.” Total losses on both sides were estimated at 40. You can read a fuller description of the battle here. Two additional incursions took place in October 1862. The first was a raid toward Haddock’s cross road, resulting in the capture of several Confederates. The other raid was on Greenville itself, and the town was captured with the death of one Federal soldier. In July 1863, Federal General Edward Potter raided through the area. You can read a full account here. 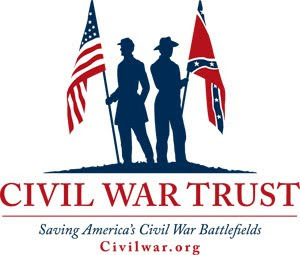 There is also a driving tour, part of the North Carolina Civil War Trail Markers program, that you can view here. The raid was to disrupt Confederate supply routes in the area. Federal soldiers entered Greenville the afternoon of July 19. Local residents said that during their short stay, the Federals looted homes and destroyed Confederate supplies. At Otter Creek Bridge, near Falkland, a group of 150 Confederates, with artillery, stopped a portion of the raiders, and forced them to find another rout. Yet another small skirmish occurred at Scuffletown, on the Pitt/Greene County border. 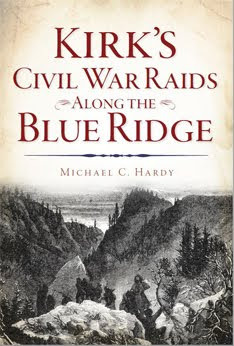 In November of 1863, another raid took place through the county. The Federals involved were the 1st North Carolina Volunteers (African-American), which captured a portion of the 67th North Carolina Troops near Haddock’s Cross Roads. A fight, involving a portion of the Federal army and North Carolina and Virginia soldiers, took place at Red Banks Church on the night of December 30. Both sides retreated, with the Confederates losing a piece of artillery. By 1864, most of the county had been raided, looted, and burned, and large-scale military action dropped off. Following the war, a Confederate monument was erected on the courthouse grounds in 1914. Last year, an individual or two asked that the monument be removed. So far, the county commissioners have been unmoved. Pitt County is doing a great job of marking and interpreting its Civil war sites. They have seven of the North Carolina Civil War trial markers, including three recently put up. You can learn more about the new markers here. Folks – I’m off to Concord this afternoon to speak to the Carbarrus Guards SCV Camp. 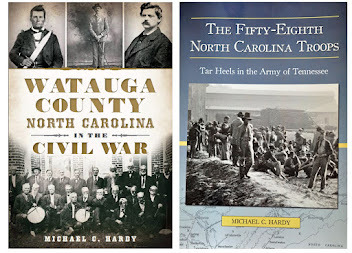 On Friday, I am working with a school group here in Avery County, and on Saturday, I’ll be attending the annual meeting of the North Carolina Society of Historians in Hickory. I had a great time this past Saturday at the Big Ivy Heritage Festival. It is always good to be able to get out and talk to the public about the past. We even got to put a number of rounds through a reproduction 12-pounder Napoleon. The weather was great. I have one school program to do here in Avery County this Friday, and I think that about wraps up the living history events for the year. 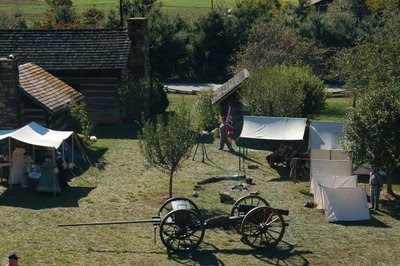 The photograph above is of our camp this past Saturday, taken from the reconstructed fire town on park grounds. We have already been invited back next year. By the way, a large number of the 25th North Carolina (Company I, I think), was recruited from the Big Ivy community. Folks – I’m off this Saturday to participate in a living history at the Big Ivy Heritage Park in Buncombe County. If you get a chance, stop by and say hi!